Dog and handler move at least 2 ft. (0.6 m) in the following directions (in any order) using slow, controlled steps: forwards, sideways to the right, 180-degree pivot left, and 180-degree pivot right. Purpose: Demonstrate slow, controlled movement with precision. Exercise set-up: This exercise starts at the end of the engagement exercise (when the dog has set up in the specified default heel position). 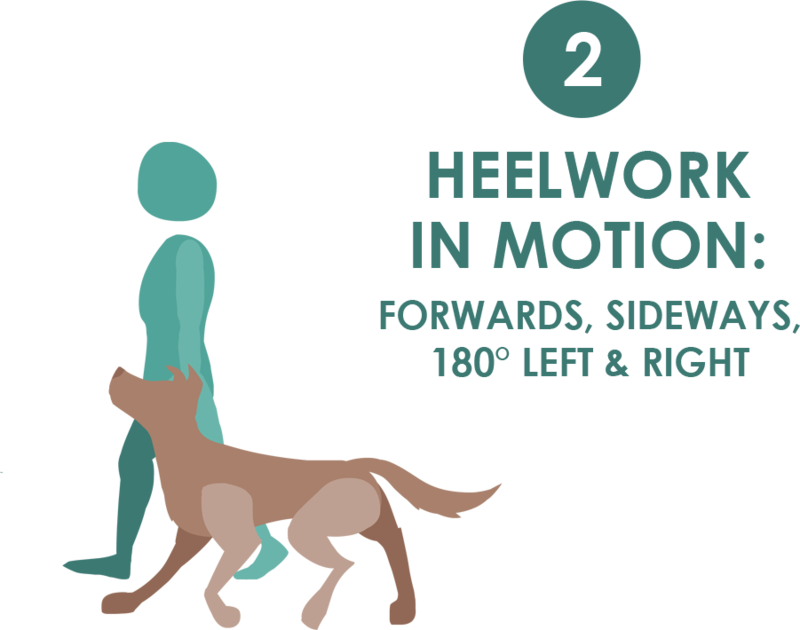 Handler and dog must heel at least 2 ft. (0.6 m) forwards, sideways to the right, pivot 180 degrees left and 180 degrees right – all at a slow and controlled pace. The handler may give a new heeling cue for each change of direction, but cannot praise during the exercise. Dog must remain parallel to the handler, within 6 inches of heel position at all times. A hand held overhead as a visual target without touching the dog is allowed. The dog may take any position at the halts. The exercise ends when all four steps have been demonstrated. Non-qualifiers: Dog does not stay within 6 inches (15 cm) of heel position at all times. Dog does not show all four steps for the required 2-foot distances. Dog requires multiples cues to stay in position within a single maneuver. Handler praises dog during the work. Dog does not remain parallel to the handler. Handler’s hand touches the dog’s head. Handler moves so quickly that the dog’s understanding of position cannot be assessed. Video does not permit the exercise to be adequately judged. Tip: When moving sideways to the right, this is NOT a rally “side step right.” Move slowly so that your dog can remain parallel in all directions! Note: Backing up is not required for this exercise.